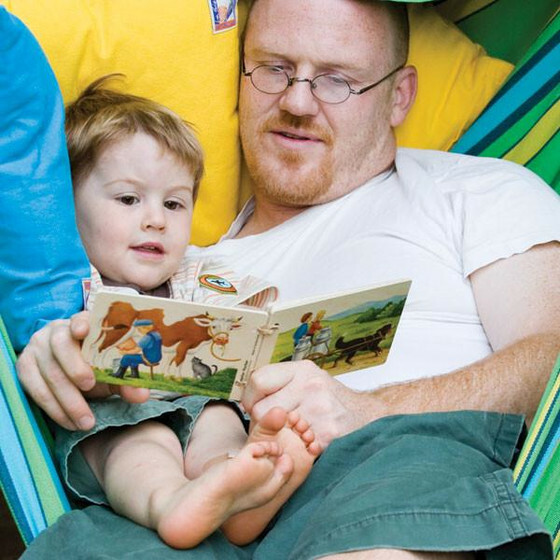 We all know the importance of reading to our children, but there are many small things you can do in the course of your time with your baby, toddler, and preschooler in addition to reading to them that will help build the foundations of reading. The National Research Council identifies six early literacy skills that benefit children when they start school. It is likely that you are already fostering many of these skills, but all are easy to bring to your child in your regular interactions. Phonological awareness describes our ability to recognize the sounds of our language. Nursery rhymes and simple songs you might chant or sing for your child nurture this skill. The rhyming words and repeated initial consonant sounds found in these hallmarks of childhood highlight the individual sounds of our language. If you cannot remember many from your own childhood, you can find books of familiar and new rhymes that can foster the rhythm of your day and feed your child’s language learning. When you find yourself describing to your child the steps involved in dressing or the plan for the day, you are exposing them to narrative skills. What may feel a bit like prattling or talking to yourself is actually giving your child a story arc for their immediate experiences. As they get a little older, you might ask them the story of their play or what happened on an errand to encourage them to try their budding narrative abilities. A child’s reading fluency seems to be greatly affected by the sheer number of words they are exposed to; a wider vocabulary promotes reading. This skill can be a lot of fun to develop, as many parents will expand their own vocabulary- at least in certain areas. You can tell your child the names of all the fruits and vegetables in the produce department or be more specific when discussing household items (shoes, sandals, boots, galoshes, loafers, etc.). You can give them the words to describe the parts of your house or the types of vehicles you see on the road. Naming the plants and animals you see around your house or in your neighborhood also expands their vocabulary. 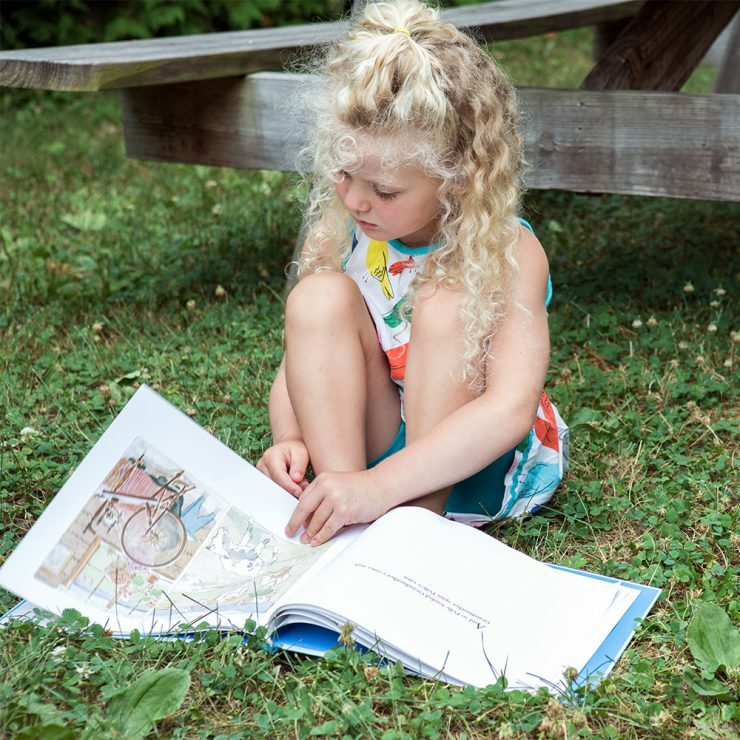 You can also find books with foreign and familiar animals, plants, foods, household items, or vehicles that many children enjoy looking through and talking about. When you find a book of particular interest to your child, you’ve begun to provide for the next point— print motivation. Children who know good or interesting things can be found in books will more eagerly approach reading. For parents, it is also important to provide books you want to read; there are so many great books. A little time in your local library should reveal a vast array of titles you and your child can enjoy together. Ultimately, your children are not going to be encouraged to engage with books if they are bored by the books available, or you find reading the books to be a chore. Print awareness is the point at which your child realizes the marks on the page are related to the words you are saying. Some children make this leap only through the repeated exposure of being read to, but others benefit from some direct teaching. You might point out a word that shows up again and again in a story to help your older preschooler begin to make this association. You can also help them find words that are repeated within a story. Once children begin to make this association, they are well on their way to unlocking the door to reading. The final skill is letter knowledge. When you point out the first letter of their name or they find other words that start the same as “dog”, they are showing this capability. You can use street signs, labels, the signs in grocery stores, or alphabet books to strengthen their recognition of different letters. However, just finding the repeated sounds in those same nursery rhymes is another great way to train their ear to hear the individual sounds of our language. While you may intuitively promote these skills, it never hurts to label them; knowing what they are and how they work can strengthen your approach and help your children to read with greater fluency more quickly and with greater pleasure.